Arrangements have been made in several parts of NorthEast to celebrate the 16th death anniversary of Annai Poopathi on Monday (April 19). She died after fasting for 31 days from 19 March 1988 demanding that the Indian government should stop the war against the Liberation Tigers of Tamil Eelam and initiate talks with the LTTE. In the wake of the collapse of Karuna's revolt, there is increased interest in the Batticaloa region in observing the death anniversary of Annai Poopathi on a grand scale, sources said. The Batticaloa District Mothers’ Front in a statement appealed to Tamils in this region to observe the Annai Poopathi remembrance day by flying red and yellow flags in their houses and business establishments and to attend the final day event scheduled to held Monday evening Annai Poopathi mausoleum. 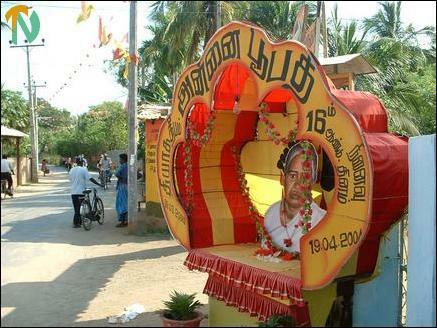 Annai Poopathi remembrance events are organized in the Jaffna district on the divisional basis. From morning till evening with token fasting, sources said. The Remembrance Day events will take place at Karanavai Mootha Vinayagar Kovil premises in Vadamaradchchi division, Colonel Kittu mausoleum premises in Muththirai Santhi in Jaffna division, Velanai Thuraiyoor Iyananar Community Centre premises in the islets and the Open Air Theatre in Kayts division. In Thenmaradchchi area Annai Poopathi Remembrance Day events will be held at Sangaththanai Murugan Kovil premises, said a statement released by the Jaffna political division of the Liberation Tigers of Tamil Eelam. In Trincomalee district sports events were held in the LTTE controlled Muttur east Sunday and the winners would be presented with prizes and certificates Monday at Chenaiyoor at the concluding Remembrance Day event, sources said. Poopathy Kanapathipillai was born in a small ancient Tamil village of Kiran in Batticaloa, as the third daughter to Mr. Annamuthu and his wife Periyapillai. Because of her family's economic situation she was withdrawn from her school and was married at a tender age of only twelve. Twice a mother and widowed all within a short span of life. Poopathy married again to Mr. Kanapathipillai, a widower with two sons and a daughter. Two more sons and two more daughters resulted from this marriage and Poopathy became the mother of ten children. "Annai Poopathy has made an indelible mark in the golden history of our struggle. She sacrificed her life for the freedom struggle of her people renouncing her life as a mother, as head of a household and as a woman. Her moral war against the Indian army was an embarrasment India. She did not die as a human being. Her sacrifice symbolized the uprising of Tamil eelam motherhood," said Pirapaharan, in a release about her death.